How It Was Taken, and the First Three Union Men on the Ramparts. BY CECIL CLAY, BREVET BRIGADIER-GENERAL, UNITED STATES VOLUNTEERS. A good many people have written to your paper during the last 18 months about the capture of Fort Harrison, outside of Richmond and north of the James, on Sept. 29, 1864. 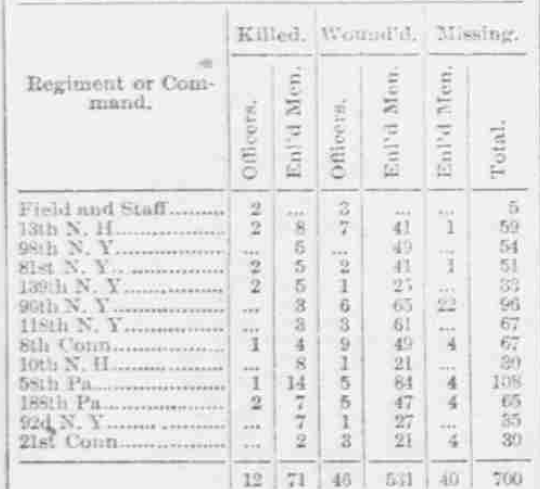 A number of these were enlisted men, who in attending to their duty could have had but a limited field of observation and an imperfect idea of what went on elsewhere than in their immediate vicinity; while some who were wounded before the fort was entered were deprived of the opportunity for personal knowledge of what followed; and others are shown by what they write to have depended on hearsay principally. A soldier who attends to his duty has not time or opportunity to meddle with the business of other troops than those of the enemy. An officer’s duty, on the contrary, is to attend to other people’s business; that is to say, he has to see that each and all of those under him do what is to be done and do it properly. The higher his grade the more he has to look after, and the wider his scope of observation; but, of course, beyond a certain point he is liable to lose sight of details. I am not anxious to write an account or description of the action of Sept. 29, 1864. I published my personal recollections of the storming of Fort Harrison years ago in the Germantown Telegraph, of Philadelphia. Since then I have examined every official record on the subject, and corresponded with men and officers of both sides, but have found nothing yet to cause me to alter what I wrote then. I wish, however, to state briefly some facts which may serve to correct errors into which your correspondents have fallen. Fort Harrison was stormed by the First Division, Eighteenth Corps, under Gen. [George J.] Stannard. Other troops crossed the river and fought at Fort Gilmer and elsewhere, but not with the First Division. There is no official record of the strength of the division at this action; the nearest returns in date I can find show present for duty and equipped: Officers, 138; men, 2,783. Gen. Stannard in his report says his field return for Sept 28 showed 3,115 for duty. The 5th M[arylan]d. was left in camp, so that 260 must be deducted, leaving 2,855. The 40th Mass[achusetts]. was also away. It is possible that number turned out, but not probable. The division was at once formed for the assault. There were three brigades of four regiments each. 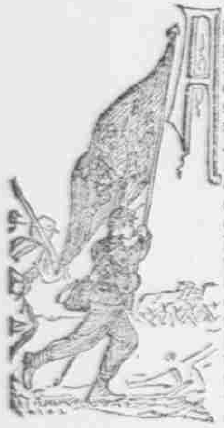 The First, containing the 13th N[ew]. H[ampshire]. 81st [New York], 98th [New York] and 139th N[ew]. Y[ork]., was on the left; the Third, containing the 21st Conn[ecticut]., 92d N[ew]. Y[ork]., 58th [Pennsylvania] and 188th P[ennsylvani]a., on the right. Two regiments of the Second Brigade—the 8th Conn[ecticut]. and 96th N[ew]. Y[ork].—remained in the center, the other two—the 10th N[ew]. H[ampshire]. and 118th N[ew]. Y[ork].—being deployed as skirmishers, and later falling back on the column. Each brigade was in column by division, with a regiment in line in front, so that the division was like a large E, with the long side in front. Some of the 1st Conn[ecticut]. [the 1st Connecticut Heavy Artillery, the 21st Connecticut, somebody else?] were used as skirmishers to protect the left flank of the column. The 58th P[ennsylvani]a. was in line at the head of the Third Brigade, and the guide was right. I was then the senior officer with the regiment and commanded it until the fort was taken. Lieut. Johnson and I marched at a couple of paces to the right of the right file. The regiment dressed on us, and the division on the regiment. This was an excellent position from which to see all that went on, as we could see the whole front and one flank of our men, the works in front, and several regiments of the enemy who were marching parallel to our direction, in column of fours, and entering the works a little way to our right. Col. [Samuel H.] Roberts, of the 139th N[ew]. Y[ork]., who was in command of the Third Brigade, halted it not far from the works, to get breath before making a rush. After a short pause he exclaimed: “Now, men! just two minutes to take that fort! Just two minutes!” And we made a rush straight to the ditch, into which we jumped. close to which we went in, and the discharge knocked the carriage off the pintle so that it was useless. They then lost heart, and when they saw us coming over ran round by the huts and the rear of the big traverse, to help their comrades on the side next to the river, where as yet no one had got in. EIGHT COLOR-BEARERS HIT THAT DAY. Col. Roberts, who was detailed to command our brigade, got out of a sick-bed to go into this action. I never asked him why he chose our regiment to lead the brigade, (and so guide the division,) but he has asked me what I thought of his halting the brigade to breathe before making a rush. I think it was a good idea, knowing that the 58th [Pennsylvania] was in front; a pause like that could not be made with every regiment. The names of the commanders of the First and Second Brigades have been mentioned often by writers about this action, but Col. Roberts, who commanded the Third Brigade, is entitled to more prominence than they, for he commanded the guiding brigade and the one that first entered the fort. Some of the reports speak of hesitation as the columns neared the fort, and of reforming the men, etc. Whatever there was of this was in the First and Second Brigades. There was nothing of the kind needed in the Third. At Cold Harbor in 1864, after the disastrous charge of June 3, the 58th P[ennsylvani]a. was picked out to charge and retake a rifle-pit in front of the enemy’s main line—the regiment numbered then less than 150—which a regiment more than double its numbers had been unable to hold. First taking the caps off all its pieces, it charged and took this pit and held it from early morning until relieved at 11:30 at night. With this regiment in the front, and Col. Roberts in command, the Third Brigade did not need any reforming until after the fort was entered. 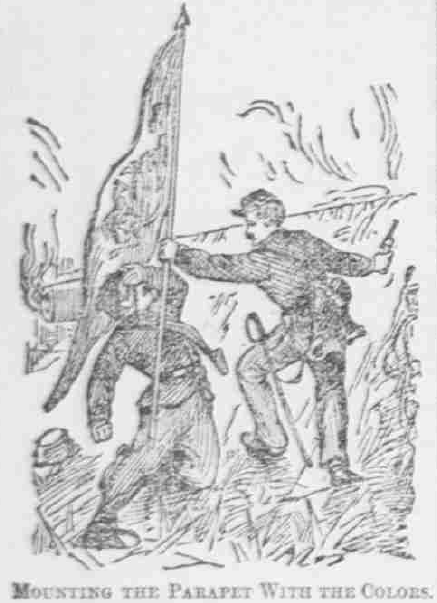 The testimony of the officers and men who were inside the fort resisting our attack confirms the decision of Gen. [Godfrey] Weitzel, and the illustrations in the papers published at the time show the troops entering the works where I have said we went in. Fort Harrison was taken because enough men were sent against it to stand all the loss the garrison could inflict and still have enough to beat the defenders. Fort Gilmer was not taken because the attack was not made in the same way, but by successive charges of one or two regiments at a time, who were of course easily driven off. If the garrison of Fort Harrison had been armed with breech-loaders, it would or ought to have been a physical impossibility for the small division that stormed it to have even pretended to get in. The garrison was small and indifferently armed with old-fashioned guns, all muzzle-loaders. With breech-loaders they should have been able to inflict three or four times the damage, and that would have turned the division into a minus quantity.